How do marketers in your organization request new marketing automation campaigns? If your answer involves the water cooler or yellow sticky notes—and you’ve ever had any confusion or errors in production—perhaps you should consider introducing a more formal process! 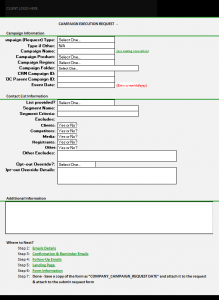 Campaign Request Documents and pre-built templates can bring much-needed structure to an often complex process. 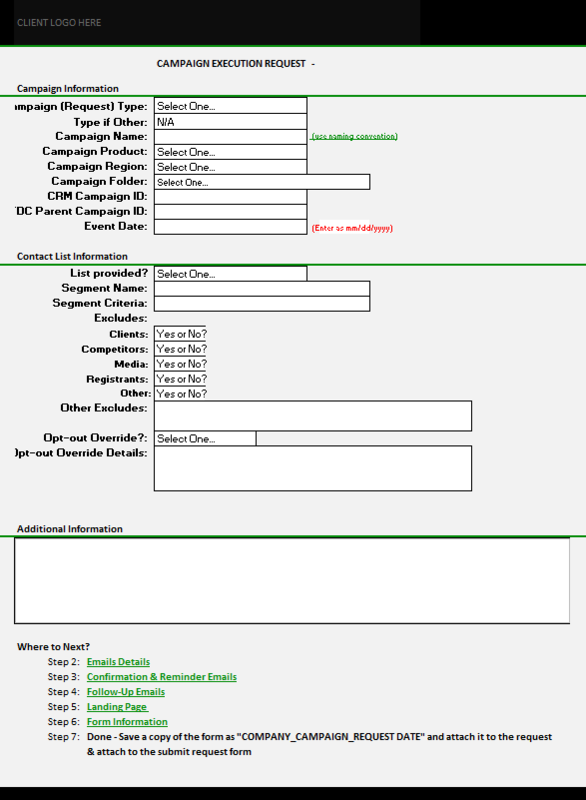 A campaign request document—for example, an Excel worksheet or a Word document—allows you to gather all of the necessary details needed to build assets for campaigns. That way, when your campaign production team is asked to build assets such as emails, forms, landing pages, and develop campaign flows, you don’t need to keep going back to the requester for additional details. This process also helps minimize the chance for mistakes, omissions, and confusion as to the requester’s intentions. A simple Excel worksheet offers a way to round up all the information you need from the requester. The campaign request form lets your requesters “set it and forget it”—once they’ve submitted it, they’ve done all their work. They can turn their attention to other projects, knowing that you’ve got everything you need to deliver an effective campaign. When you offer this option, the requester simply selects the desired template from a pick-list or checklist on the request document. The producer then clones the template, makes the needed changes, and builds the asset in a fraction of the time it would take to build it from scratch. In fact, even if you wear both the requester AND the producer hats, it’s still a good idea to build those templates to suit your own internal processes: you’ll save yourself a great deal of time and effort. We’ve discovered that establishing the campaign request document and templates, and encouraging their use, really makes life easier for everybody. It gives the requesters the freedom to be creative without having to worry about the details. And it gives you the ability to do your job efficiently. In the end, implementing a formal campaign request process results in more effective production of higher quality campaigns—and don’t we all like the sound of that? Interested in knowing more about Campaign Request Documents and pre-built templates to request new marketing automation campaigns? We’d love to talk with you; to schedule a call, just drop a note to our Campaign Execution team. Learn more about how DemandGen’s Campaign Execution Services can help increase marketing ROI. John Bokelmann leads the Campaign Services team that supports DemandGen clients in digital marketing campaign development, production, and deployment. He provides strategic marketing operations leadership, develops and implements optimized workflow processes, and reinforces marketing best practices for both B2B and B2C clients.